The Los Angeles teachers union has denounced the decision by Los Angeles Unified School District to hire 400 substitutes who will stand in for full-time teachers if they go on strike in January. In a statement, representatives from United Teachers Los Angeles wrote that it is "irresponsible to think that 400 substitutes can educate more than 600,000 students," and added that the organization believes "it is illegal for the district to hire people outside our bargaining unit to teach in LAUSD classrooms." In response, LAUSD issued a statement today at 5:00 p.m. stating that, "We have a duty to provide an education to our students, and we will take appropriate measures to do so." The substitutes' hiring was reported Friday by the Los Angeles Daily News, and follows the announcement earlier this month that LAUSD teachers will strike as of Jan. 10, 2019 if they can't come to an agreement with the district about their contracts. 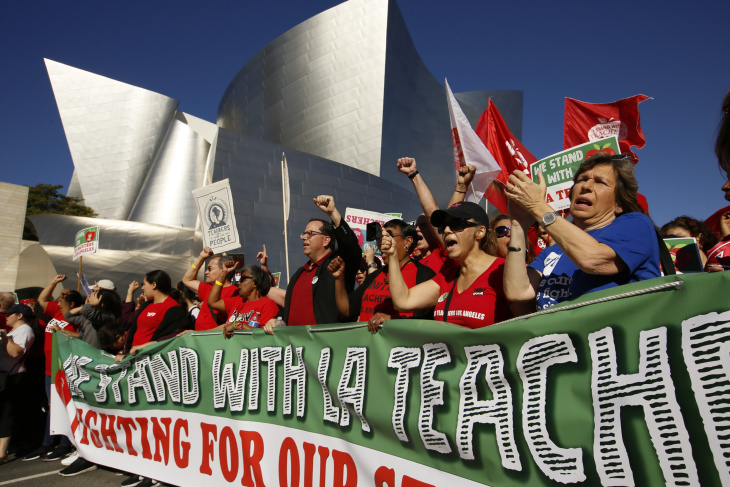 Those contract talks have been ongoing between UTLA and LAUSD since July, and have only become more and more contentious. Dec. 28., 5:10 p.m.: This article was updated with a statement from the LAPD. This article was originally published at 4:46 p.m. on Dec. 28, 2018.